Many adults have lived under the impression that they would simply have to endure the scars left behind by severe acne from their youth, as well as the embarrassment and social discomfort that goes along with it. With some of the advanced, highly effective laser treatments now available, it is no longer necessary to have to deal with the physical and emotional scars from teen years. Within this article, you’ll learn about some of these advanced techniques – how they can help you regain your optimum appearance, and how you can feel better about yourself than you have in years. How much does laser treatment surgery for acne scars cost? Laser treatment for acne scars is without a doubt the most effective treatment approach for most people, and it promises the best long-term solution for a problem that can be extremely significant in the lives of some adults. The first thing to know about laser treatment is that it is FDA-approved as a very safe and effective process. While it may not be 100% effective at removing all scarring, in most cases it does achieve remarkable results, which are dramatic improvements over the untreated skin surface. 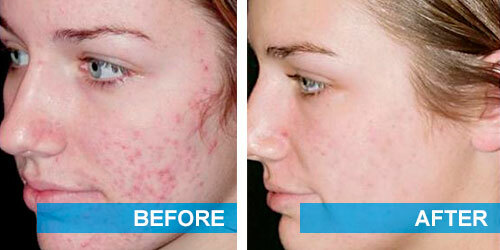 Laser treatment for acne scars is an FDA-approved procedure. There are several different types of laser treatment, each one representing the best approach for a specific type of acne scarring, and since all of these are non-invasive treatments, there will be only a modest recovery time necessary after the procedure. Generally speaking, a laser treatment session can be performed on an outpatient basis in a doctor’s office with no real preparation, other than using a mild anesthetic to reduce discomfort. It’s important to understand that results will not be immediate, because of what really happens during laser treatment. Damaged skin tissue is targeted by the laser beam and is burned away in a safe and effective manner, which then stimulates the growth of healthy new skin cells that were prevented from forming by the scar tissue. Before this healthy new skin tissue has a chance to develop, there will probably be a period lasting 4-5 days where some degree of swelling or redness occurs on the skin surface, after which the real effectiveness of the laser treatment will become evident. The cost of laser treatment will depend on which type of program is being used and how many sessions are necessary, so to gain an accurate understanding of cost, it will be necessary to consult with your dermatologist or cosmetic surgeon. Some ballpark estimates of cost are included below however. Dermatologists who perform laser acne scar removal will discuss options with you for choosing the best type of laser treatment for the degree of scarring you have. Some scarring is relatively superficial and can be treated with surface-level laser treatment, and some scarring goes deeper and must be managed by laser beams which penetrate to sub-surface levels for the targeting of scars. In this technique a high-powered laser beam is projected at the uppermost layer of skin which has sustained scarring. To a lesser extent, the beam also tightens and smooths the middle layers of the skin. This procedure generally takes about an hour, during which the patient is mildly sedated, and wears goggles to protect against the laser’s light beam. The actual process involves the dermatologist passing a wand-like tool, which contains the laser beam, over the target area to remove the scarred cells. There are two main types of lasers used in laser resurfacing, the CO2 laser and the erbium laser. The CO2 laser is the more powerful of the two, and is ideally suited to operate on wider and deeper scars. Since this is a slightly more disruptive process, recovery time can take up to two weeks. The erbium laser treatment is less powerful, and it is aimed at treating scars that are smaller and more shallow. Recovery time for this process is only about a week. CO2 laser treatment is the approach which is most commonly used by victims of severe acne scarring, because it has the ability to penetrate deep into skin layers and target scar tissue which may not be apparent on the surface. Instead it uses infrared skin lasers to heat the inner layers of skin and stimulate the production of collagen and fresh new skin cells to replace damaged ones. This procedure takes less time than ablative laser resurfacing, only about 30 minutes or less. On the downside, because this process is aimed at healing from within, the effects will take longer to see than when ablative laser treatments are used, because ablative methods target the visible, exterior skin surface. It results in hundreds of microscopic holes where scarred skin cells are removed, and old skin cells are broken down. Surrounding healthy skin quickly helps to repair the tiny damage areas created by the laser beams, and fresh new healthy skin grows in. Fractionated laser resurfacing does not produce the kind of dramatic results that ablative or non-ablative skin resurfacing can achieve, and it generally requires about four treatments. Laser treatment for the removal of acne scars is considered to be the gold standard of treatments for getting rid of acne scars. No other approach achieves the same kind of comprehensive, permanent effects. The best laser treatment in your own case will depend on how severe your scarring is. If you have acne scars which are numerous, deep, and wider, the CO2 laser treatment will probably be the most effective treatment approach. If you have shallower scarring, with a lower incidence of scars, you will have more options available to you, because either fractionated laser treatment or non-ablative laser treatment may work best. When scarring is less severe, you may opt for a process involving fewer sessions, or one which is more budget friendly, but these are personal objectives which you should bring up in discussions with your dermatologist during the planning phase of any treatment. To get the most accurate assessment of laser treatment costs, you’ll need to discuss with your dermatologist which of these treatment approaches will be used, and how many sessions will be required to achieve optimal results. Short of that, here are some estimates you can use as a starting point. 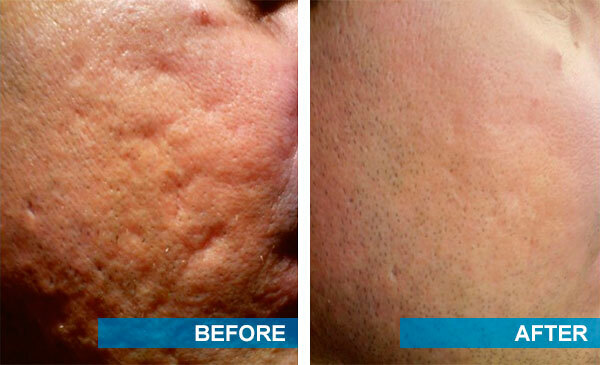 Ablative skin surfacing is the most effective treatment. Ablative skin surfacing is fairly expensive, beginning at around $2500 to treat one area of the face. Non-ablative laser resurfacing sessions each cost around $500, but more than likely, there will be between four and six treatments necessary to accomplish desired objectives for resurfacing. Fractionated skin resurfacing that treats the entire facial surface will run about $1500, and if something less than the full area of the face is being treated, the cost will be less. If laser skin resurfacing for acne scars is something that you feel is simply not within the realm of possibility for your budget, there are other therapies available which can help, even if they do not achieve the kind of dramatic success which laser treatment can. For instance, there are various other acne scar remedies such as fillers, which can be used to reduce the depth of visible scars and to blend in with surrounding skin. There are also some home remedies and some self-help literature which can advise you on how to get rid of acne scars naturally. These alternatives can certainly help to some degree, but since none of them can actually remove the old, dead scar tissue in the same way that laser treatment can, all of them must fall into the category of ‘partially successful’ approaches. Scar tissue on your face or other parts of the body, which have been left behind by teen-aged acne become very difficult to treat as people age into adulthood, and after they’ve formed, they prevent the growth of healthy new skin tissue in affected areas. By far the most effective way to remove these old acne scars is to have them burned away by one of several types of laser treatment. The specific laser treatment you should adopt will depend on how severe the scarring is which you need to have removed. All types of laser treatment are relatively easy processes to go through in a doctor’s office, and they involve a slight amount of discomfort during the procedure, requiring only a local anesthetic. Afterward, there may be some visible signs of the treatment, such as redness or swelling, but this will subside quickly. Depending on the type of laser treatment used, the effects of the process may be apparent within a week or two, or it may take a couple months if the middle layers of skin are treated, rather than the surface layers. Ultimately however, there will be very noticeable improvement in your appearance, and these beneficial changes will be lasting aids to your ongoing self-confidence.